Safari hardware kit. Bought a set of used safaris at the last show or swap meet? 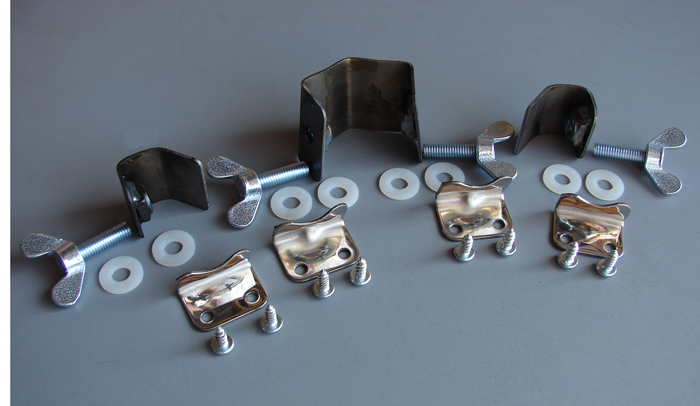 This kit includes the weld in pieces, dash tabs and screws, wing nuts and friction washers for the slides. Juergo de ferreteria para ventanas safari de combi. Si Ud. compro un juego de safaris usadas, aqui tiene las piezas para soldar al chasis, las chapas del tablero con tornillos, las tuercas de mariposa de visagras. Click the button below to add the Safari Hardware Kit to your wish list.